Showing results for tags 'Soarin'. Okay, roleplayers. Did any of you notice the short lived Fallout rp that appeared and then vanished about a week ago? 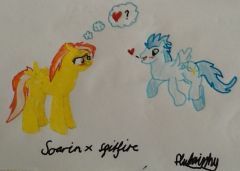 Well, Soarin and I have been attempting to batter together a somewhat realistic story and adapt the world to make some kind of canonical sense. I'm going to make it very clear that this isn't based at all on Fallout: Equestria. The world is based on Fallout: New Vegas with a few things taken from Fallout 3. That is a concious choice made on the fact that neither of us have actually managed to read the gargantuan beast of a story, despite extremely good feedback. I'm sure there are other bronies in the same boat as us too. To tantalise your taste buds, I'm going to show you the intro post we have planned, and hope that you guys like it so far: The Overseer stands at the front of the room besides a projector screen. The fluorescent lighting that lines the ceiling casts its fierce glare over the room. The taste of sterilised air fills your mouth, and the gentle hum of the recyclers fills your ears. You glance beside you to see five other ponies all sat in chairs like you are. You've known them all since birth, but you couldn't call all of them your friends. The Overseer clears his throat loudly and starts to speak. "Vault 54 has remained undisturbed for two hundred years. A large part of Celestia's final solution to save ponykind from the oppression of Discord and Nightmare Moon; The two beings that caused The Great War of Chaos that lasted twelve whole years until Celestia ended it at great cost. We all know the tale of how she brought the sun into the atmosphere in a desperate bid to rid our world of those two great evils. It was a sacrifice that was not made in vain however. These vaults were designed to keep us safe and secure for two hundred years, and now that time is over. Celestia's final act has kept the world alive, but only barely. 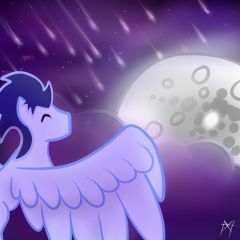 However, Celestia left us the power to revitalise the land. Somewhere in the ruins of Ponyville lie the Elements of Harmony. When all six are retrieved then we may be able to harness their power to bring life back to our land.That is why the six of you have been chosen. Each of you represents one of the Elements. Each of you are our best hope of bringing Equestria back to its former glory. There is a small problem however, as soon as the gates unlocked I sent out scouts. Security Officer Shields and his squad of five left a week ago, and only Shields has returned. Apparently the world outside is now an inhospitable wasteland. I'll leave it to him to fill in the details." The Overseer took a step aside as an armoured pony trotted up to the front of the room. "The world outside these walls is full of things that want to eat ya. Mutated parasprites, ridiculously large manticores, radioactive zombie ponies, the works. Fact is though, that there are still some sentient ponies hanging around. We scoped out Ponyville to find that the place has been fortified by some kinda magical forcefield. We ran into a few ponies there that say that some mysterious colt known only as House runs the entirety of Ponyville through a vast network of employees. So fact is that not only are there still some friendly ponies out there, there's organised factions. Far as I can gather there's two more major players in the area. A group calling themselves the NER or New Equestrian Republic are operating out of the ruined city of Canterlot up in the mountains. Apparently their territory has expanded up until Ponyville. From what I hear they're run by some dragon named Spike who once knew the Princess. They stand for order in these trying times, so they might be a potential ally. On the opposite side of the town is the Everfree Forest where a group calling themselves the Followers of Discord have set up shop. They hate the NER with a passion and stand in the name of chaos and freedom. Anarchy if you ask me. Apparently run by some mare called "Headcase". I did hear word of other smaller groups, but I don't think they're gonna be an issue. Well, except for these roving groups of raiders. 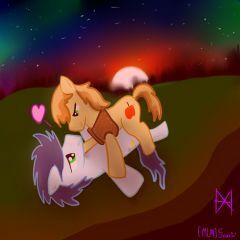 Ponies who attack and kill others to steal their stuff. They set up ambushes. Took out three of our group before we could send them packing. Anyway, I hope you're all armed. Celestia was kind enough to stock all these vaults with the latest in military tech in case the final solution failed. Out there, a lot of ponies are using similar stuff, so we're gonna need to use it too. If we all stick together then it's going to be fine. Now, any questions?" Okay then. Here's a quick summary of how this RP is going to work. Soarin and I will act as GM's (Game Managers) which basically means that we'll play any characters you encounter out there in the wasteland. We'll also pop up with random events and story specific events that are adapted to whatever scenario you currently find yourself in. This way we can play effectively with a small cast, and still have that overarching story feel to it. The story is not cast in stone. You still have full control between these events, and you can react to these events however you wish. We will not make any changes or effects on your character without your prior permission, so you don't have to worry about randomly losing your leg to a rabid diamond dog. Now we need six characters for this RP to work. Each character must represent an Element of Harmony, however that's not to say you should carbon copy the Mane Six. You can interpret these Elements however you want to, and are allowed to use characters from other rps as long as you can link them to the Element. Ponies only please though, Griffons won't really fit in with the world we've built, but you can play as any species of pony, bar Alicorn of course. Tech level is going to be New Vegas, so expect guns and robots, although magical weaponry and constructs are equally welcome. The idea behind this is that because the war dragged on for twelve long years, Equestria was forced into an arms race to hold back the forces of Discord and Nightmare Moon. This gave them time to come up with the weaponry you see in Vegas, as unicorns can work very fast if properly motivated. The RP is set around the Ponyville area. If you have any other questions, then feel free to ask them here. The RP will be set around the six Element Bearers, although we will allow tag-alongs to the group, such as other security guards, and any friendly Wastelander we encounter. So don't worry if you miss out on one of the six spots. The group can also split up, but try to keep in at least pairs. The two of us will find it very difficult to RP as every other character if we've got six groups of ponies gallivanting about. We will allow multiple characters, but you can only control one Element Bearer. You can also apply for a spot on the GM team if you want, but that won't be necessary unless we get the other positions filled first. 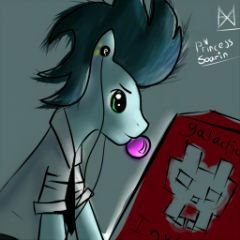 Right so spots: GM's: Soarin Cainiam Elements: Laughter	- Harlequin (Thebluemage) Generosity - Rebel Rouser (WhiteSlash) Kindness	- Silver Heart (Dusty) Loyalty	- Cloud (CloudShimmers) Honesty	- Fern (Walker) Magic	- Sigma Saerid (InsanityDash) Other Characters: Security Officer Shields (Cainiam) Scopes (Soarin) Cool Temper (ThunderBrony) Pyro Crash (Ironkau) Right, so apply below if you're interested. Edit: Attention! All Elements slots have now been filled. Please bear with us as we start this up. Any new players, feel free to join when in progress as a Wastelander, or if you act quickly then you can play a Vault member with practical skills, like an Engineer, Doctor or Guard. 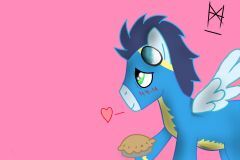 Edit 2: We are up and broadcasting here: http://www.canterlot...e-apply-in-ooc/ Anypony else who wants to join is going to have to be a Wastelander. Them's the breaks. Drawn and colored during stream tonight! 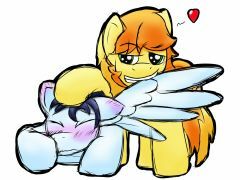 Braeburn is helping Soarin preen his wings. I'd imagine that tickles a LOT. From the album: My art stuffs. 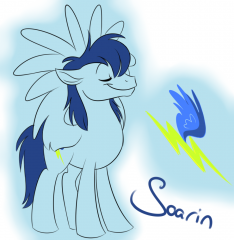 Ok so has anyone guessed I love Soarin' yet? Internet was down for 2 hours so I decided to give these two some attention. 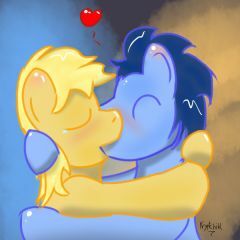 I'm making pony's kiss and you can't stop me!!! Everypony's favorite studs hard at... not work I swear I'll get back to doing requests! ...eventually. Well, it's been a while since i updated, sorry I hope you enjoy! Just how I picture Soain' with his mane down. He looks like Zak from Fern Gully LOL Also a design I made for his cutie mark. 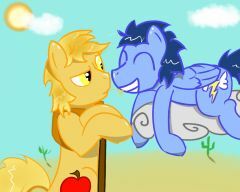 This took 3 hours ^^ -Insert favorite shipping pony next to soarin'- Enjoy!